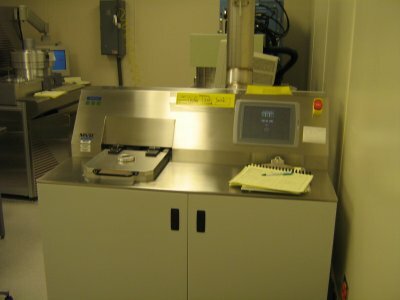 The Applied MicroStructures, Inc. Molecular Vapor Deposition tool currently has water, FDTS (heptadecafluoro tetra hydrodecyl-trichlorosilane), and MPTMS (mercaptopropyl-trimethoxysilane) materials that can be deposited. FDTS is hydrophobic (CA > 90) and MPTMS is hydrophilic (CA < 90) The chamber is set to 50 C but can range from 25 C to 60 C, the vapor lines are set to 100 C but can range from 40 C to 100 C, and the source silanes can also be heated. This tool is also capable of producing a water plasma.